“Must Haves” For Medical Survival In A Natural Or Man-made Disater Situations. Guest Bio: Joe Alton, also known as the Disaster Doctor, is an M.D. and Amy Alton, also known as Nurse Amy, is an advanced registered nurse practitioner and a certified nurse midwife. They are the authors of the #1 Amazon Bestseller in Survival Skills, Disaster Relief, and Safety/First aid, “The Survival Medicine Handbook”; a guide for when medical help is not on the way. They have just published a brand new 2nd edition to their book about survival medicine. Dr. Joseph Alton and Nurse Amy Alton talk about the items that are “must haves” for medical survival in a natural or man-made disater situations. Neal Howard: Hello, you’re listening to Health Professional Radio. I’m your host Neal Howard. Our guest is Dr. Joseph Alton and Nurse Amy Alton. 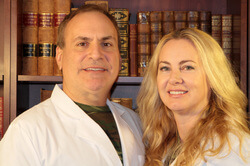 They’re the authors of the number one bestseller on survival skills on Amazon.com, The Survival Medicine Handbook. It’s a guide for when medical health isn’t on the way. How are you doing today?